Wisconsin delegation represents! From left to right: Jolene McNutt, Ginger Reuter, Mary Gross, Greg Renstrom, Liz Schroeder, Kent Pegorsch, Kimberly Kester, Louann Hausner, Danielle Dale, 2018 American Honey Princess Jenny Gross, 2019 American Honey Queen Hannah Sjostrom, Kim Sjostrom, Doug Sjostrom, Mary Kettlewell, Derald Kettlewell, Gary Reuter, and Anna Kettlewell. There were 830 people from throughout the United States and Canada attended the recent American Beekeeping Federation convention held in Myrtle Beach, South Carolina from January 8 – 12.
toring Bee Health; Molecules to Landscapes”. Dr. Spivak is always a thought provoking speaker! Other inspiring talks included a report from the Foundation for the Preservation of Honey Bees and the introduction of foundation scholars. Also the 2018 American Honey Queen and Princess and the new 2019 honey queen contestants were introduced. The highlight of Wednesday’s meeting was the report by Dr. Samuel Ramsey from the Bee Research Lab USDA at Beltsville, Maryland. His topic was “Tropilaelaps Mites: A Fate Worse Than Varroa”. This was a spectacular report saying that we have not seen the worst yet…that Tropilaelaps will eventually come and it will be larger and more devastating than Varroa. Interestingly enough, Dr. Ramsey ultimately won the Roger Hoopingarner Award for most outstanding presentation as voted by the members of the conference. Wednesday also saw the opening of the trade show where 87 exhibitors answered questions and showed off their latest equipment and technical items for sale. Thursday’s keynote speaker was Dr. Reed Johnson, Department of Entomology at Ohio State University. His presentation was “Interaction Between Insecticides and Fungicides Applied to Almonds During Bloom”. Other topics on Thursday included “Toward a Fungal Pharmacy: Using Metarhizium and Mushroom Extracts to Honey Bee Health” by Dr. Walter Sheppard of Washington State University. “Bee-Friendly Microbial Control of Arachnid and Arthropod Pests” was presented by Vera Strogolov. Dr. Jennifer Tsuruda spoke on the use of photography for record keeping. Special interest groups met in the afternoon and these addressed the small scale/sidelined group, package bee and queen breeders, honey producers and packers, and commercial beekeepers. Each lane had several programs presented by professionals. The speaker that was highlighted on Friday was Dr. Dennis VanEngelsdorp who spoke on the topic of “Mites Matter”. Dr. VanEngelsdorp is also president of the Bee Informed Partnership. One of the speakers who always meets with great accolades is Peter Berthelsen. He is in charge of the Bee and Butterfly Habitat Fund and his talk was “The Art and Science of Getting Great Honey Bee Forage on the Landscape”. Another great topic covered was by Bob Danke and Frank Rinkevich of the USDA Bee Lab in Baton Rouge. Their topic was “An Integrated Approach to Breeding Better Bees.” The Foundation For the Preservation of Honey Bees is always well attended and this year gave four scholarships to students studying apiculture at four different universities in the United States. The Kids and Bees program took place Friday morning and was attended by over 300 kids and their parents. Hands-on participation included “The Art of Beekeeping, The Science of Beekeeping, The World of Beekeeping, and The Future of Bees: It’s Up to You!” This program is always a huge success. Friday afternoon, the honey show was concluded with the auction of the prize winning honey and beeswax competition. Congratulations to Jim and Karen Belli on taking three blue ribbons and best of show. Nick Thill took home 3rd place in the White honey category. “Medical Issues in the Apiary” was presented by Dr. Michael Misco on Saturday morning. “Bees as Seeds discussed the connection between habitat, nutrition, health and longevity of bees and their relationship to breeding. Especially interesting to the small beekeeper were topics on skin care products, candle making, how to make creamed honey, encaustic painting, and how to get young people involved in beekeeping. American Honey Queen Hannah Sjostrom and American Honey Princess Nicole Medina. 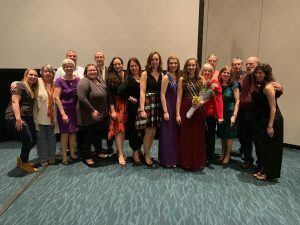 The annual reception and banquet, live auction, and crowning of the new 2019 honey queen was held on Saturday night at the conclusion of the convention. The New Jersey honey queen, Nicole Medina, was named American Honey Princess. She is from Green Township, New Jersey, is 19 years old, and is a business administration major. 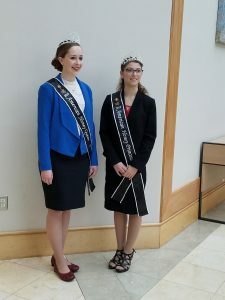 Hannah Sjostrom was the queen candidate from Wisconsin and was crowned the 2019 American Honey Queen. She is from Maiden Rock, WI, is a nursing major at University of Wisconsin, Eau Claire, and is a 3rd generation beekeeper. Watch for upcoming news on the 2020 ABF Convention which will be held in Schaumburg, Illinois next January.